NEU : biologisch, nachhaltig, abbaubar und für Heißgetränke geeignet! 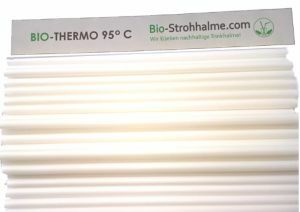 Die BIO-Thermo 95 ° C Halme werden aus einem zertifiziert kompostierbaren Kunststoff gefertigt. Dieser Kunststoff basiert auf überwiegend nachwachsenden Rohstoffen. Andere Anteile in dem Kunststoff sind überwiegend mineralische Füllstoffe, die ebenfalls natürlichen Ursprungs sind. Die Trinkhalme sind zu 60% biobasiert, biologisch vollständig abbaubar und industriell kompostierbar. In diesem Prozess spaltet Wasser, Sauerstoff und Wärme den Kunststoff auf, damit dieser anschließend von Mikroorganismen verdaut werden kann. Zurück bleibt wertvoller Kompost der als Dünger für den Anbau neuer Pflanzen genutzt werden kann. So leisten sie einen wertvollen Beitrag zur Kreislaufwirtschaft und zur Verringerung der Umweltbelastung und bieten wesentliche Vorteile während des gesamten Lebenszyklus. 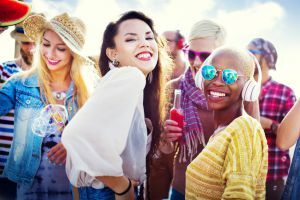 Die Halme haben eine Hitzebeständigkeit bis zu 95 °C und sind ideal für alle Getränke – vor allem für Heißgetränke (ohne hochprozentigem heißem Alkohol). 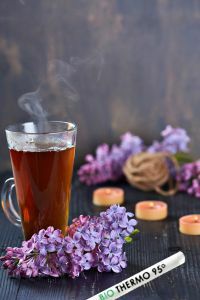 NEW: biological, sustainable, biodegradable and suitable for hot beverages! 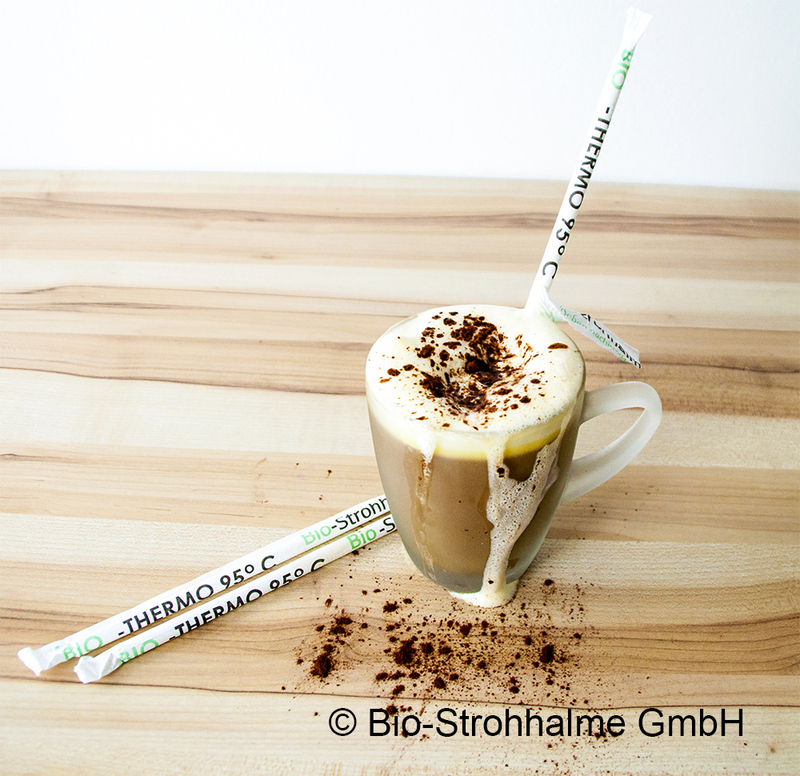 The BIO-Thermo 95 ° C Straws are being made of a certified and biodegradable plastic. 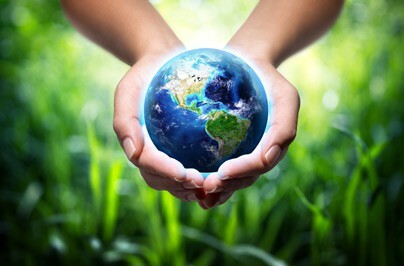 This plastic mainly consists of renewable raw materials and mineral fillers of also natural origin. The BIO-Thermo 95 ° C Straws are 60% bio-based and fully biodegradable in industrial composting plants. In the composting process, water, oxygen and heat split the plastic so that it can be digested by microorganisms, leaving only valuable compost that can be used as fertilizer for the cultivation of new plants. Thus, the BIO-Thermo 95 ° C Straws contribute to the recycling management and to the decrease in environmental pollution and are offering considerable advantages during their whole life cycle. The pellets of which the straws are being produced fulfill the requirements of the European standard DIN EN 13432 and the “US Standard ASTM6400” for compostable and biodegradable polymers. Life span /durability around 12 to 14 months in dry environment (from – 15 to + 20 ° C). 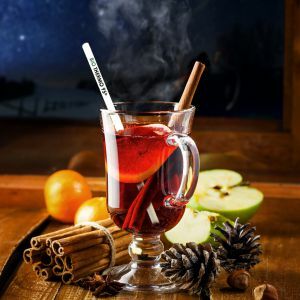 The straws are heat stable up to 95° C and thus ideal especially for hot beverages (without high-proof hot alcohol). Novità: biologiche, biodegradabili, compostabili e adatte anche a bevande calde! Le cannucce BIO-Thermo 95 ° C sono realizzate in plastica compostabile certificata. Questa plastica si basa su materie prime prevalentemente rinnovabili. Altri componenti della plastica sono prevalentemente componenti minerali, anch’essi di origine naturale. Le cannucce sono biologiche al 60%, completamente biodegradabili e industrialmente compostabili. In questo processo, acqua, ossigeno e calore decompongono la plastica in modo che possa successivamente essere digerita dai microrganismi. Ciò che rimane è un compost prezioso che può essere usato come fertilizzante per la coltivazione di nuove piante. 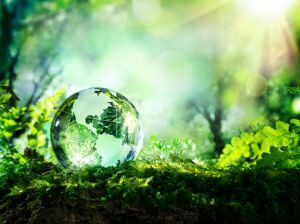 Apportano un contributo prezioso all’economia circolare e alla riduzione dell’inquinamento ambientale e offrono significativi benefici durante l’intero ciclo di vita. La materia prima utilizzata nella fabbricazione delle cannucce è conforme alle regolamentazioni “DIN13432 standard europeo” e la “American Standard ASTM6400” per polimeri compostabili e biodegradabili. Immagazzinamento: secca (Da + 20 ° C a -15 ° C ) – Durata prodotto: 12 a 14 mesi. Le cannucce hanno una resistenza al calore fino a 95 ° C e sono ideali per tutte le bevande, specialmente per le bevande calde. Ein hitzebständiger Strohhalm macht ihre “heißen” Drinks zum echten Eyecatcher und lässt diese noch leckerer aussehen. 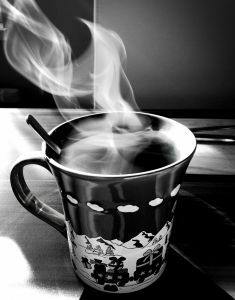 With a heat stable straw every “hot” drink becomes an eyecatcher and it makes it look even more appetizing. Una cannuccia termoresistente che renderà le vostre bevande calde ancora più gustose.